The Kh mer ethnic minority people of the Mekong Delta province of Tra Vinh are fastidiously preparing for their traditional New Year festival, Chol Chnam Thmay. Chol Chnam Thmay takes place from April 14-16 marking the changing of the gods that look after people and their life on earth, including the annual harvest. During the three-day festival, Khmer people flock to pagodas to pray for a bumper harvest, good health, good luck and prosperity. 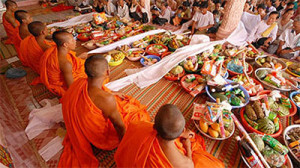 They also make offerings to the gods and hold rituals at home in worship of their ancestors and Buddha. Thach Chan, former Director of the Tra Vinh provincial Department for Culture, Sports and Tourism, said the three-day festival is the most important event of the year for the Khmer people to commemorate their parents and show gratitude for their ancestors. On this occasion, local authorities visit and present gifts to social policy beneficiaries and congratulate Buddhist clergies and followers. Many cultural and sports activities are also held during Chol Chnam Thmay festival, such as music and dance performances, folk games, and sports competitions.